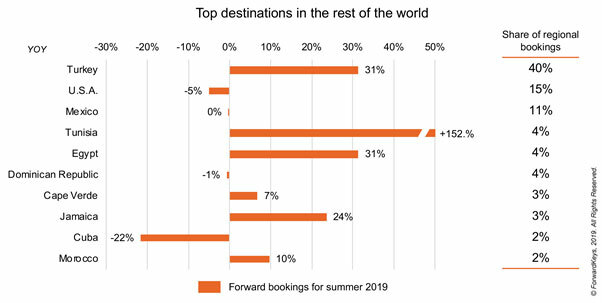 first post-Brexit holidays, according to latest findings from ForwardKeys which predicts future travel patterns by analysing 17 million booking transactions a day. Instead, many Brits appear to be flocking elsewhere in the southern Mediterranean. Turkey, with a huge 40% share of non-EU holiday bookings, is seeing demand ahead 31% on last year. Tunisia, Egypt and Jamaica are currently also doing very well. These trends are very much in line with those observed over the summer of 2018, when security concerns in Turkish, North African and Middle-Eastern destinations started to fade.